Responding to Mayor de Blasio’s obvious point, the New York City police “union” head said the mayor had thrown all cops under the bus by implying that police practices are racially based. Mayor de Blasio, a white man with a Black son, expressed a bitter truth that most white people deny: race and racism underpin police practice and U.S. society. 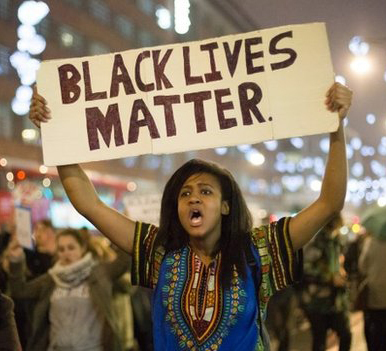 Significantly, the “Black Lives Matter” campaign is being joined by a growing number of whites. Most whites still believe, however, that race is never the issue when police arrest or kill Blacks. An overwhelming majority of whites in every poll agree with the grand juries and prosecutors who let the cops walk free, no matter what violence/murders cops commit. The facts show just the opposite, that police across the country target African Americans and other minorities for petty charges that have led to mass incarceration, severe brutality, and death. Eric Garner was alleged to be selling “loosies” (single cigarettes) as the reason for his arrest. Despite the oblivious majority of white people, there is growing resistance to the vicious racism of the criminal justice system. The Black-led protests that began in Ferguson in the summer have spread to New York and hundreds of other cities large and small. It is forging a new movement for fundamental change. Historically, the turning points in race relations in a country built by slaves and cheap labor from African American and other minorities occurs when progressive-minded whites join with Black popular resistance. It happened in the civil rights movement in the 1960s, which inspired a youth radicalization that challenged the ruling class policies on war, women’s rights, and other social issues. We are at an early stage of this happening today. President Obama, representing the ruling class’s interests, understands this better than any previous president. His objective is to contain the outrage and limit changes to militarized police forces. While the starting point of this tug of war on race relations is Black anger and protest—without which there can never be a successful challenge to institutional racism—changing the attitude of a majority of whites, who are oblivious to the reality of Two Americas going back to British colonial rule, is key to bringing fundamental change to the system of injustice. There is a practical social, psychological and economic advantage to living in a white skin. It’s the central reason that whites and Blacks for the most part see everything about the legal system differently. Ferguson, Missouri can be the new Selma, Alabama. In 1963 Martin Luther King was attacked as an “outside agitator” and “communist,” but Selma showed the determination of the civil rights movement against state violence upholding legal segregation. It galvanized the country and led the ruling class to stomp down on its southern wing to grant legal equality to African Americans. Without those fundamental changes, Barack Obama would not be president. 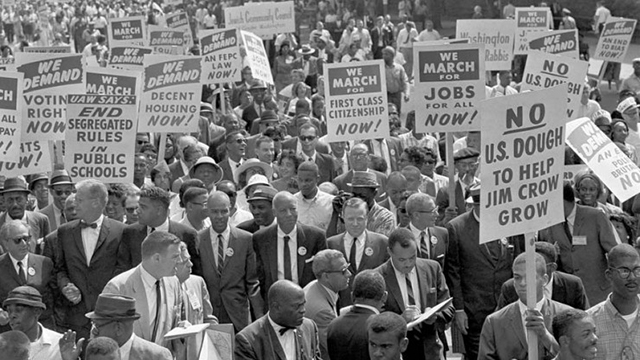 The white counter offensive to Black rights began immediately in the 1970s as affirmative action programs and “forced busing” for equality came under attack. Since Obama’s election the racist drive to roll back gains, including voting rights, has accelerated. Ferguson, a small St. Louis suburb, has taken center stage in the resistance. It became a wakeup call for millions of African Americans that are fighting racial inequality and our second class status. No one in Black Ferguson, Black St. Louis County, and Black America was surprised when the grand Jury and its biased prosecutor “declined” to charge officer Darren Wilson in the killing of young Michael Brown. No one in Black America was surprised that the prosecutor used the occasion instead to indict the dead Brown and the 16 of 18 eyewitnesses (calling them liars) who said he had raised his hands to the cop to surrender. Brown was called a criminal by the prosecutor, who accepted Wilson‘s words that he looked like a “demon” and a “hulk-like figure” who thought he could go through bullets and kill him. That’s the misinformation theme in white America that is spit out daily by right wing talk radio and television commentators. When African Americans say, “Black lives don’t matter” in America, it is not hyperbole but based on centuries of experience of white supremacy, in laws (de jure) and in action (de facto). 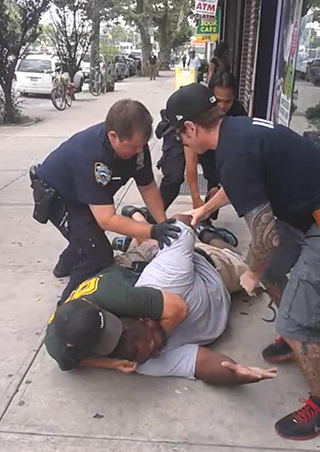 Eric Garner was attacked by five police and choked to death. Garner was minding his own business when assaulted and killed by the cops (only one was even referred to the grand jury). The largest circulation newspaper in the city, The Daily News, headlined its front page: “We Can’t Breathe.” Garner had said to the cop choking him, “I can’t breathe,” at least 11 times. The cops left him an on the ground like a dead animal. The EMTs did nothing too even though Garner still had a pulse. No CPR. No attempt to provide air to his lungs. He died on the way to the hospital. The private citizen who filmed the gang in blue has since been harassed and arrested by the cops. Supporters of the secret grand jury system and the police blame Garner for his own death because, they claim, he resisted arrest. Further, they argue, it’s not the cops’ fault he was overweight and had health issues. Some charge that Blacks commit more crimes than whites, so cops must be aggressive to protect their own lives. This is a typical diversion argument of those supporting the racist status quo. White crime and Black crime are similar, but arrests and incarcerations are divergent. For example, white on white homicides (83 percent according to FBI data) are almost as prevalent as so-called Black on Black homicides (90 percent). Grand juries always indict–except when it comes to cops, where we see prosecutors convening grand juries to avoid bringing charges. The sick joke is that prosecutors can indict a ham sandwich. From 2009-2010, secret grand juries at the federal level pursued 160,000 cases for possible charges. Of those the grand juries voted not to indict only 11 times (less than .0001 percent). The data for state and county prosecutors, and grand juries, are similar. “The young organizers in Ferguson from Hands Up United, Lost Voices, Organization for Black Struggle, Don’t Shoot Coalition, Millennial Activists United, and the like, understand they are at war. Tef Poe, Tory Russell, Montague Simmons, Cheyenne Green, Ashley Yates, and many other young Black activists in the St. Louis area have not been waiting around for an indictment. “Nor are they waiting for the much vaunted Federal probe, for they have no illusions about a federal government that provides military hardware to local police, builds prisons, kills tens of thousands by manned and unmanned planes without due process, and arms Israel in its illegal wars and occupation. They have been organizing… They remind us, not only that Black lives matter—that should be self-evident—but that resistance matters. America is not a unified nation-state based on equal rights and fairness for all its citizens. It is a white-dominated country with smaller sub national groups that continuously are discriminated against and seen as less than human, and certainly less than whites. The Black community more than any other group supports a nonracial, colorblind, and fair society based on merit and equality. We are still waiting. While class issues are a factor in race relations, white workers tragically are some of those most opposed to justice for Michael Brown and Eric Garner and buy the lies of the cops. They see their “white community” under attack by demon-like Black men. If a white cop says he feared for his life by an unarmed Black teenager or man, in their eyes, it is obviously true. These bigoted attitudes cannot be overturned by new training or education, or cameras on cops. (The very idea that cameras are needed indicates the depth of the problem.) Rooting out racist police brutality requires that the government take affirmative legal action, backed by force. It starts with removal from the job without pay, firings, arrests and public trials. It means independent police oversight commissions must be created, controlled by communities suffering from police violence. Community control of police is essential. Local cops must live in the communities they patrol. When cops know they are accountable and will face immediate penalties, a different outcome is possible and likely. The ruling class fears popular Black-led resistance more than anything else. That’s why liberals and conservatives alike falsely tell protesters that change is only possible by the ballot box. Malcolm X said the oppressors only understand Black Power. A determined minority, fired up, he pointed out, can become the majority.